On November 13, the media became interested on Rantau state assembly seat which is in Negeri Sembilan. It was reported that the Election Court will rule out on the legitimacy of UMNO Mohamad Hasan’s uncontested victory over the Rantau seat prior to GE-14 on December 16. Previously, PKR candidate Dr. Streram Sinnasamy was denied entry to submit his nomination document as he forgets to bring his identification tag on the nomination day (April 28). On December 16, the court ruled out for a fresh election for Rantau because Election Officer Amino Agus Suyub did not follow the rules in his action of preventing Dr. Streram from entering the nomination centre. This means that there will be another by-election in the nation. 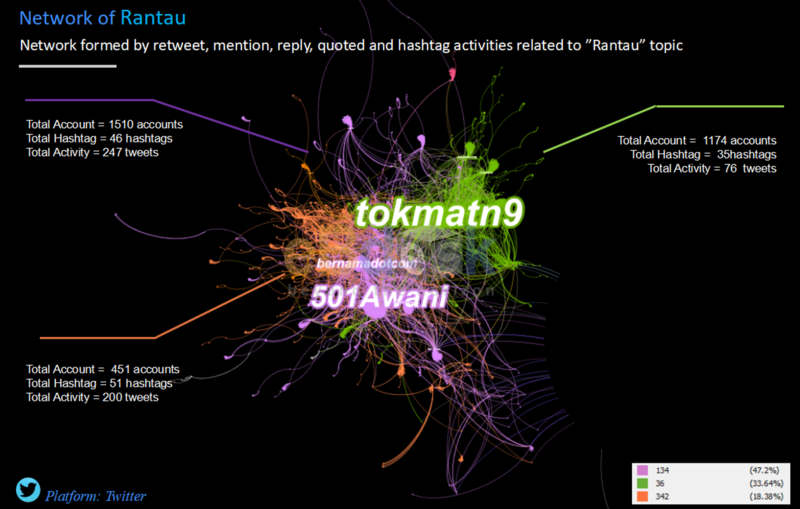 In Twitter, the topic “Rantau” reached its peak on the 16th of November with almost 4000 tweets. On this particular day, the Special Election Court in Seremban had ordered the state seat of Rantau to be vacated and declared UMNO’s Datuk Seri Mohamad Hasan’s victory in the 14th general election as null and void. Consequently, Tok Mat pledges to defend the Rantau state seat. On the next day (November 17), interestingly, PKR President Datuk Seri Anwar Ibrahim said that he received suggestion from the members to nominate former Pandan MP Rafizi Ramli as the candidate for Rantau by-election. Network above shows the trend of “Rantau” on Twitter. It can be classified into three clusters – purple, green and orange. 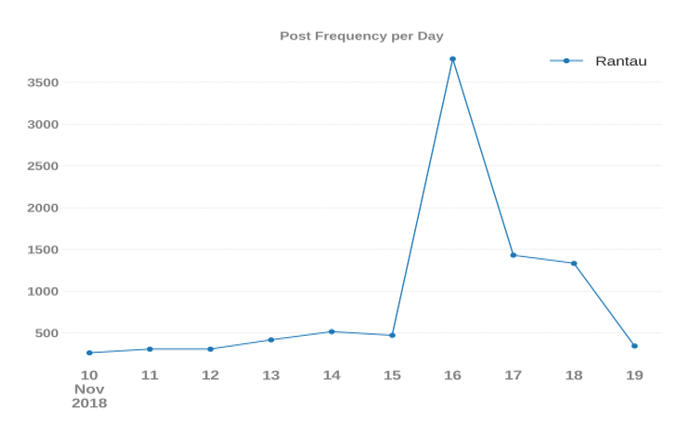 The purple cluster is the largest group with 247 tweets. Its main influencers are news outlets such as @501awani and @bernamadotcom which covers on the Election Court ruling, null and void for Mohamad Hasan’s uncontested victory at Rantau. Next, is the orange group with 200 tweets. This group said that Rafizi Ramli will be the best candidate to contest for the by-election because he is the one who defended Dr. Streram when the latter was disqualified. This group main influencers are @ReformasiMuda, @midirahim and @chegubard. Lastly, the green group consist of 76 tweets with Tok Mat himself (@tokmatn9) acted as the main influencer. This cluster talks about the Election Court’s ruling on Tok Mat’s disqualification. From here, we can see that the supporters of Rafizi Ramli swiftly played on the idea that Rafizi Ramli is the best candidate for the by-election. If Rafizi were to be listed as PKR candidate, it will be unfair for Dr. Streram. Therefore, it will most likely not be the case since PKR need to take care of its party image after the internal conflict between Azmin’s camp and Rafizi’s camp.